In the past, when a reader wanted to save some piece of news from their favourite magazine the first move used to be taking the scissors and cutting off the page and keeping it in a file. This metaphor illustrates the reasoning that Ramy Adeeb had in mind when he launched Snip in the Spring of 2011. Snip is a social networking, in which the user can collect “the best of the web” and, besides this, the user can give his/her opinion about the content they like most. In a special interview to this blog, Adeeb, the founder and CEO of Snip explained that the idea came up during the Arab Spring. As an Egyptian, he was increasingly asked by many friends of yours to share his thoughts and articles on what was happening in Egypt. As he was “unable to find a permane nt and centralized place to collect, share and opine on all content” he was reading at that point, he teamed with former Twitter developer Mark Percival to create this platform of knowledge sharing through bookmarking. In this sense, the roots of Snip.it led us to what Mashable, on an article about this company, remind us: “you can use your collections for personal reference or as curation tools to publicy demonstrate your expertise and subject-matter knowledge”. Snip.it organizes users’ content collection in 15 languages, ranging from Portuguese to Japanese. Moreover, this social networking divides the content in sections such as: Arts & Culture, Science, History, Food&Drink, Tech&Entrepreneurship and so on. At the first sight, one can think that the service does the same as Pinterest. However, according to Ramy, Snip is more about aggregating “serious content” and “about forging meaning conversations around that content”. 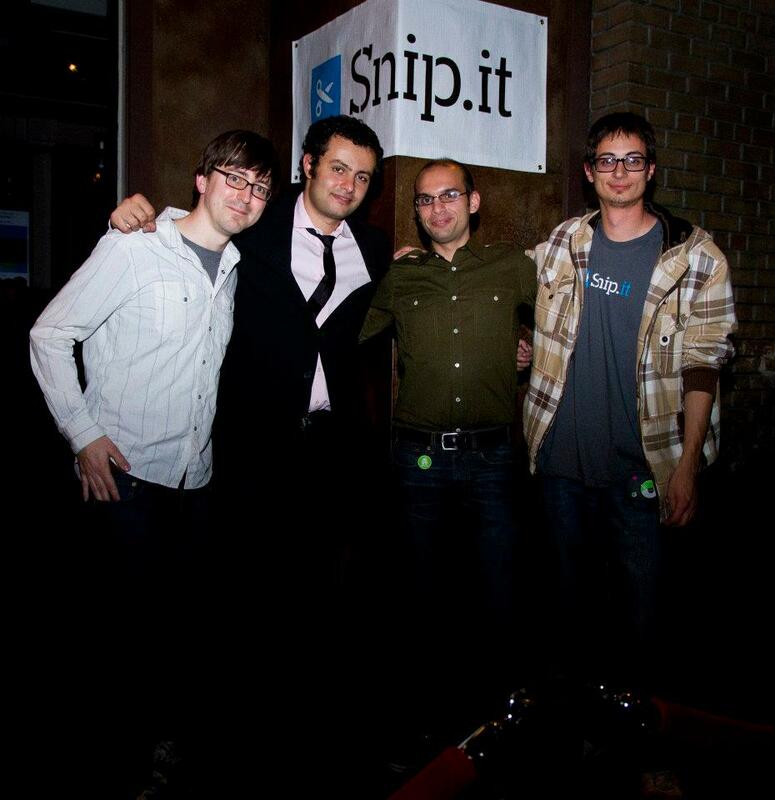 Snip brings together content and opinion, termed by this start-up as “snips”. The “snips” can be saved privately, or shared with friends and unknown people. The Spin’s business model is based on advertisement and on promoted-snips like interactions. According to Mashable, Snip.it has raised an undisclosed sum in funding from Koshla Ventures, True Ventures, Charles River Ventures and SV Angel. When asked what the company’s team has learnt so far, advises entrepreneurs to be sure that everyone in the founding team has a role to play and to iterate fast. As he puts it: “hire great people. Most problems facing startups come from being too lazy or too rushed in hiring”. Adeeb also advocates entrepreneurs to look for a balance in decision-making. He says that “as start-up, you are always trying to decide between ‘doing right’ and ‘doing it right now’. In this sense, he advocates to not lean one way or another. “Always try to do things as fast as possible but also make sure you do them properly, otherwise you end up losing time and energy and not learn anything”, he advises. What Snip.it has been doing can be understood as content curation. Some people have been associated ‘content curation’ as the cause of Pinterest’s popularit. Content curation is the process of cherry-picking the best content from the web that is important and relevant to share with their community. It is much related to the work of an arts curator, in the sense that unlike automated services (such as Google News), it is a human being doing the sifting, sorting, arranging in specific topics, and publishing what information online is appropriate and relevant to her audience. ‹ PreviousWhy should news organizations care about location-based services? Content curation in its ‘classical sense’ is slightly off-beam and wrong. To do it properly (and commercially) you need to be able to capture ALL of a client’s data first. Then, read it as if you were a client and be able to sift it into ‘strategically exciting or dangerous’ or ‘interesting’ or ‘example of our excellent work’ or whatever. Then using tools like the one described above, you provide the 3-4 or 5 stories (NO MORE THAN THAT) in a bite sized newsletter style summary form to the top decision makers inside a company. Then the value is in the story selection and recognising just how important a story is – as if you were another member of senior staff. How these tools are being used at the moment exists very much in the ‘free’ world environment. I like this set of stories I show you. I am a company I saw this cool stuff, I share with you. I say, stuff that. Let’s make money – we can undercut the world’s media monitoring and evaluation houses by hundreds of pounds or dollars a day and offer them a better service. That’s what I am doing and want to do more of.